Not a new concept in watchmaking at all, the idea of constant force has taken center stage as watchmakers strive for ever greater accuracy and precision. 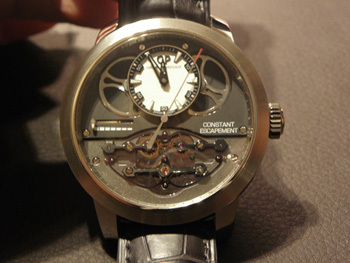 Essentially, constant force is a means of improving the rate of a watch by making the torque of the spring constant throughout the entire power reserve duration. Generally, in mechanical watches, the force that powers them (the mainspring) is irregular. When a watch is fully wound, it delivers stronger energy in the first few hours of running time, then that power levels out, and then, toward the end of the movement’s reserve, when most of its power is used up, it slows down significantly before stopping – thereby making the timepiece slightly inaccurate. In an effort to make the watch more precise, watchmakers have been diligently working to provide constant force (identical oscillations at full, mid, and low power reserve) to timepieces. There are several options available to apply constant force. 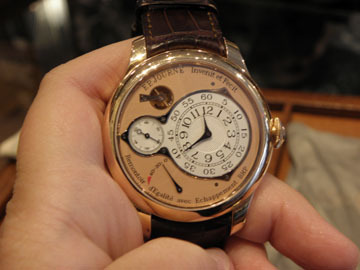 One method utilizes a fusee and chain system, while another method employs a remontoire device that is essentially a spring or detent, placed between two going train wheels, and armed to deliver the same amount of power to the balance at specific intervals of time, no matter how much power reserve is in the watch. 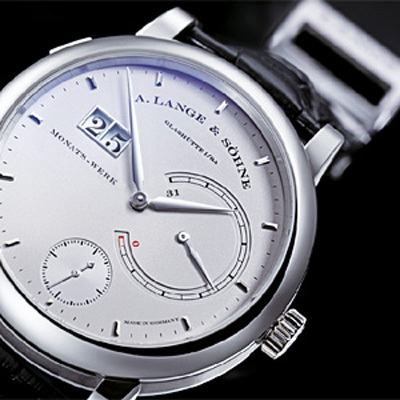 Among the brands that offer timepieces with a constant force device: A. Lange & Sohne, Dewitt and, as of this year, IWC. The newly released IWC Ingenieur Constant Force Tourbillon watch combines double moonphase display (one display each for the northern and southern hemispheres), countdown display until the next full moon, tourbillon and an integrated constant force device. watches since 1991, now offers a constant force device in the new Chronometre Optimum watch, which embodies Journe’s ongoing quest for precision and excellence. The watch incorporates the double barrel with two springs to ensure the stability of the driving force, along with the constant-force remontoire, for which Journe holds a patent, and dead beat seconds. This remontoire balances the driving force applied to the escapement to make it constant. By adding an extra gear representing an independent system wound in short spurts by the mainspring, the escapement ensures the balance’s isochronism. 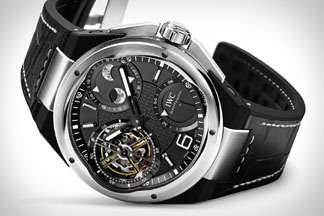 This watch also houses the patented EBHP High-Performance Bi-axial Escapement that is lubricant free. Perhaps one of the greatest strides made in constant force this year comes from Girard-Perregaux, which has unveiled the Constant Force watch. This watch – currently in testing stages — consists of an all-new high-tech constant force escapement built using silicium and other high-tech materials. This escapement delivers energy directly to the balance rather than doing so indirectly via the wheels (as with a remontoire). It is a revolutionary concept that crosses the borders and bridges the gap between traditional watchmaking and high-tech horology.